You’ve gotten so used to all the sandals in your closet that you probably forget how to style your fall shoes. You’re also probably stressing about having to put on ~real clothes~ again, and are looking for some fall outfit inspo. Well, fear not, because I’ve gathered some of my favs for this fall using shoes you may already have (or SHOULD have)! Colored sneakers are super in right now, but they may seem hard to style. I’m obsessed with this casual, yet put-together look by Puma, starring the iconic Cara Delevigne, that proves you can wear sweats and still look presentable. Matching the color of the sneakers is so important, if you can! Ok, tbh I didn’t even know how to style these, so I’m thankful that Adidas and Kylie Jenner do. I think the key is to wear some tight pants or leggings to really let the shape of the shoe pop. And by adding a denim jacket, you can turn it from athletic wear to athleisure. I could see them with some plain black leggings and an oversized sweatshirt, too! I think the key to styling a clean white sneaker (a normal sized one...not a chunky dad one) is to balance out the simplicity of the sneaker with some eye-catching pieces like wide-legged trousers or a bright jacket (or both, in this case!). I think Reeboks are the perfect sneaker in this case, because they’re sleek and simple, and don’t look overly athletic or overly #aesthetic-ey. A perfect blend. 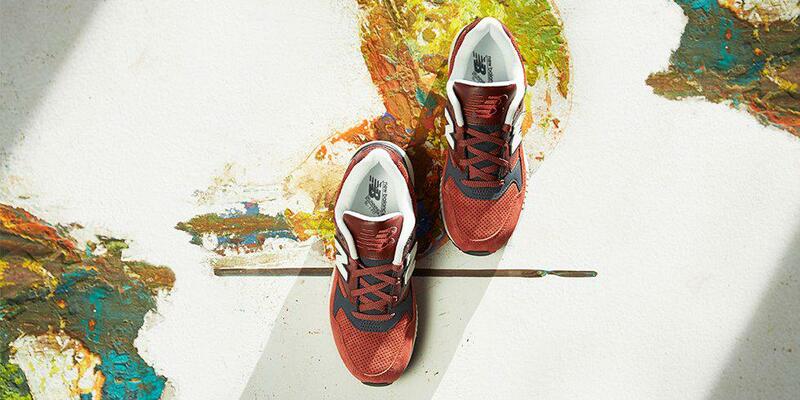 New Balance just proved to us that you don’t need to be dressed for the gym in order to wear your gym sneaks. I’m obsessed with everything about this outfit, from the rose-hued sneaks to the over-the-shoulder fanny pack. Skirts/dresses and sneakers are a HUGE thing right now, and our feet are psyched about it. One of the best things about fall is the reemergence of the combat boot. I’m obsessed with these ones from Frye, and I think this outfit can be worn everywhere from your 8am class to a Friday night party. Flannel and combat boots go together PERFECTLY, and the skinny jeans balance it out so it doesn’t look too frumpy. You could easily substitute leggings if jeans are too much to deal with (sometimes they are). I’m honestly going and buying this whole outfit today. I think the slip on sneakers trend is done SO well with mini-dresses, especially when the sneakers are sleek like these UGG beauties (YES UGG does more than just boots and YES everything is super cozy). I think my 2nd choice pairing for these would be wide-legged trousers (above the ankle length, obvi). Ankle boots can honestly be worn with ANYTHING, but I think some of my favorite pairings are skirts, dresses, and rompers. This Nasty Gal outfit would be so easy to slip on in the morning since it’s only one piece, so you don’t need to worry about matching a shirt and pants or any of that BS. It’s the kind of outfit that you can wear now through, like, late October. If you have a pair of suede shoes and you can find something that matches them, GO FOR IT. It’s such a great thing to do. I love the way Kate Spade pairs these maroon heels with a red coat with maroon detail. It can be hard to wear different suedes that don’t clash, but if you can keep one color consistent, you’re golden. And I know, this outfit would probably be better for an internship or something unless you have the motivation to dress up for class), but I thought I’d throw it in anyhow! Either add a white t-shirt and some jeans, or maybe a black dress? I’m a firm believer that everyone needs a pair of black suede ankle boots in their closet. I know this rag & bone outfit is very simple, but it’s so cute, polished, comfortable, and most importantly, easy to recreate!! Perfect for a class presentation, your internship, or even just a regular class tbh...it seems so wearable! I’m obsessed with both of these outfits from pacsun, but I especially want to focus on the lady in red. Lots of us have mules in our closets, and it’s easy to throw them on with jeans and a tee, but I think it’s a game changer to pair them with some nice wide-legged trousers, like these. The tee dresses it down, so you won’t look “too dressed up” for class (as if there’s really such thing), but you’ll still be super cozy. I’m a huuuge fan of this look. Another fall staple: the black slip-on Vans-style sneaks. I love keeping it all in the same color family, like this black and grey ensemble from Tilly’s. These shoes can be paired with a simple jeans and tee look, some flannel, a dress, anything! I could see a denim jacket or a combat jacket being paired with them, too. Lying in a field is optional. I just wanted to draw attention to one trend I’m suuuper pumped for this year: army pants and (nope, not flip flops) sneakers. You could add a denim jacket, a long sweater, or a bomber jacket like this Original Penguin outfit did. You can actually wear, like, any shoe above (maybe not chunky dad sneaks??) with army pants. I just love this combo. And it doesn’t just have to be for men! Anyone can make this their own! 5 reasons to shop UGG that won't make you say "ugh"